Published: April 21, 2015 at 07:09 p.m. Updated: April 21, 2015 at 08:26 p.m. The NFL schedule has been released! With it, every team's path to Super Bowl 50 has been set. But another path has been set as well. This one is for you, the fan. It's the path of the ultimate NFL road trip. An odyssey not for the faint of heart that takes adventurous fans to 32 different stadiums over 17 weeks in an unforgettable journey that spans 28,840 miles. Shall we begin? 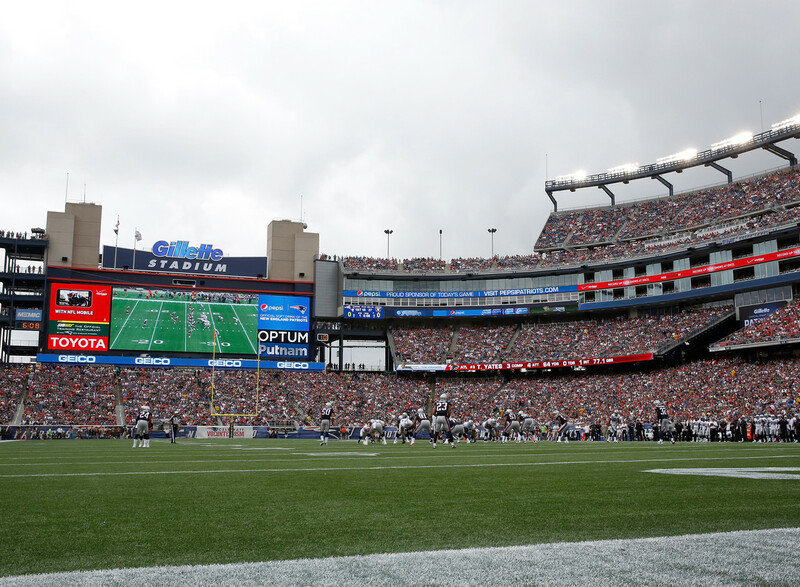 Thursday, Sept. 10 -- Steelers at Patriots, Gillette Stadium, Foxborough, Mass. Monday, Sept. 14 -- Eagles at Falcons, Georgia Dome, Atlanta, Ga.
Thursday, Sept. 17 -- Broncos at Chiefs, Arrowhead Stadium, Kansas City, Mo. Sunday, Sept. 20 -- Cardinals at Bears, Soldier Field, Chicago, Ill.
Sunday, Sept. 20 -- Seahawks at Packers, Lambeau Field, Green Bay, Wis.
Monday, Sept. 21 -- Jets at Colts, Lucas Oil Stadium, Indianapolis, Ind. Thursday, Sept. 24 -- Redskins at Giants, MetLife Stadium, East Rutherford, N.J.
Sunday, Sept. 27 -- Bengals at Ravens, M&T Bank Stadium, Baltimore, Md. Thursday, Oct. 1 -- Ravens at Steelers, Heinz Field, Pittsburgh, Pa.
Sunday, Oct. 4 -- Eagles at Redskins, FedExField, Landover, Md. Sunday, Oct. 11 -- Jaguars at Buccaneers, Raymond James Stadium, Tampa, Fla.
Thursday, Oct. 15 -- Falcons at Saints, Mercedes-Benz Superdome, New Orleans, La. Sunday, Oct. 18 -- Texans at Jaguars, EverBank Field, Jacksonville, Fla.
Monday, Oct. 19 -- Giants at Eagles, Lincoln Financial Field, Philadelphia, Pa.
Sunday, Nov. 1 -- 49ers at Rams, Edward Jones Dome, St. Louis, Mo. Monday, Nov. 2 -- Colts at Panthers, Bank of America Stadium, Charlotte, N.C.
Sunday, Nov. 15 -- Panthers at Titans, LP Field, Nashville, Tenn.
Sunday, Nov. 22 -- Packers at Vikings, TCF Bank Stadium, Minneapolis, Mn. Thursday, Nov. 26 -- Eagles at Lions, Ford Field, Detroit, Mich.
Sunday, Dec. 6 -- Ravens at Dolphins, Sun Life Stadium, Miami Gardens, Fla.
Thursday, Dec. 10 -- Vikings at Cardinals, University of Phoenix Stadium, Glendale, Ariz.
Sunday, Dec. 13 -- Raiders at Broncos, Sports Authority Field, Denver, Colo.
Sunday, Dec. 20 -- Dolphins at Chargers, Qualcomm Stadium, San Diego, Calif.
Thursday, Dec 24 -- Chargers at Raiders, O.co Coliseum, Oakland, Calif.
Sunday, Dec. 27 -- Rams at Seahawks, CenturyLink Field, Seattle, Wash.
Sunday, Jan. 3, Rams at 49ers, Levi Stadium, Santa Clara, Calif.